Home News	HoloLens Demo – Again mind-blowing! HoloLens is one of the most interesting products from Microsoft at the moment. Today Microsoft made me and probably many other people breathless again with one of its amazing HoloLens Demos. 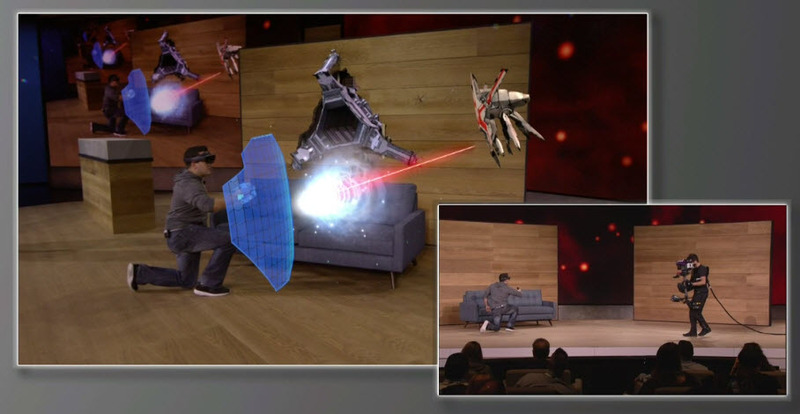 They presented the “mixed reality” game project XRay were we can have a first look on portable holograms. In this game it was a weapon for shooting on enemies and a shield for protecting against the enemies. The enemies were entering the room by “destroying” the walls of the room. The demo showed how such a game could take part in our living rooms someday. Moreover Microsoft announced that the HoloLens Development Edition will be available in the first quarter of 2016 for 3000$. I think we can expect the first consumer version of HoloLens in 2017 and then for a lower price point. I really like that Microsoft shares so many steps of its HoloLens development with the people outside in the world. It shows were the way of modern technology is going to and I can’t wait to wear this device on my head one day!